Oh Ocean Salt whatever did I do without you? 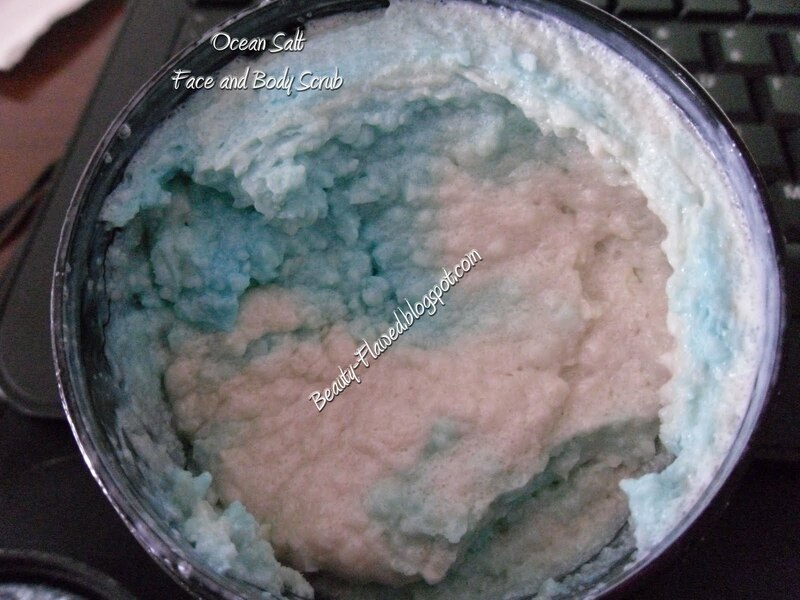 Ocean Salt is a face and body scrub that does wonders to exfoliate, even out, and balance skin. I first discovered Ocean Salt when I had flown back to Michigan to see my family, my skin was super flaky from the climate change and was pretty much freaking out no matter how much lotion I put on. So I went to the Lush USA Website and stared my search for something that would cure my super flaky skin but also help balance it out in hopes of preventing this problem in the future. Ocean Salt was the answer to all my problems. Now at first I wasn't a huge fan, I found it was just too abrasive but I quickly learned that if you swipe some water on your face before applying it seriously cuts down on the super scrubby-ness that this product offers. Once I figured that out it was smooth sailing (literally). My face was glowing, it was super soft with no more dry skin flakiness. 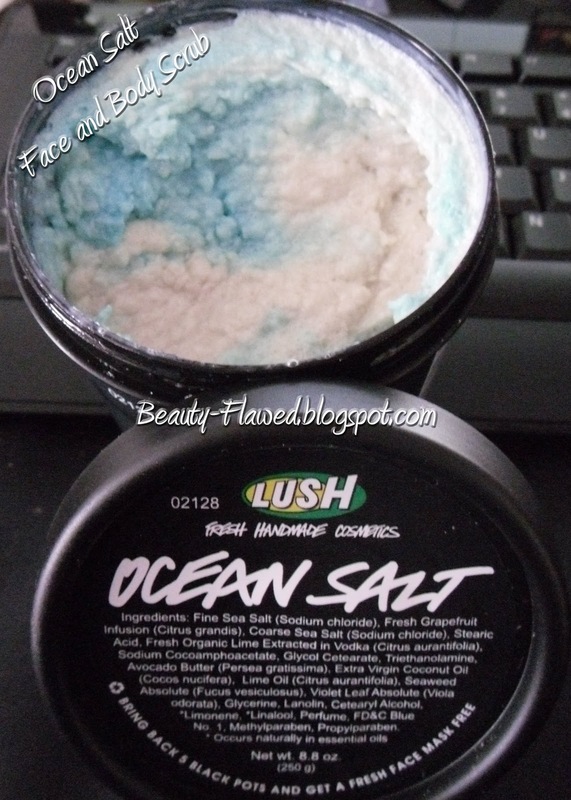 I think Ocean Salt is great for all skin types because it helps balance out your skin and prevent breakouts. I usually break out really bad on my chin or around my nose and since I started using this product back around February I have not had any bad break outs, if a little bump comes up I wash with ocean salt and the next day its gone. If you have sensitive skin I would suggest adding some extra water to your face before applying and to your fingers after applying so when your rubbing it on it will be less abrasive but still work incredibly well. You don't want to get water into your pot of Ocean Salt as it will dissolve your salt crystals and eventually turn it into a soupy mess. I also don't suggest storing it in your shower, stick to counter tops and bathroom cabinets to prolong the life of your Ocean Salt and keep the water away. It smells like a Margarita too! The Ingredients straight from the label: Fine Sea Salt (Sodium chloride), Fresh Grapefruit Infusion (Citrus grandis), Course Sea Salt (Sodium chloride), Stearic Acid, Fresh Organic Lime Extracted in Vodka (Citrus aurantifolia), Sodium Cocoamphoacetate, Glycol Cetearate, Triethanolamine, Avocado Butter (Persea grastissima), Extra Virgin Coconut Oil (Cocos nucifera, Lime oil (Citrus aurantifolia) Seaweed Absolute (Fucus vesiculosus), Violet Leaf Absolute (Violaodorata), Glycerine, Lanolin, Cetearyl Alcohol, *Limonene, *Linalool, Perfume, FD&C Blue No. 1, Methylparaben, Propylparaben. *Occurs naturally in essential oils. Now after reading the ingredients I bet your thinking "There's Vodka in this and I'm going to put it on my face?!". Alcohol and Lime mixed together have astringent properties that help kill off bad bacteria that can cause breakouts, unclog pores, and they work wonders on black heads. The Avocado and Coconut help tame dryness and put moisture back into your skin. When everything is mixed together it creates the magic that is Ocean Salt and these ingredients are the reason it works so well, you have to hand it Lush when it comes to making products that are like none other on the market and are made from high quality fresh ingredients. I can honestly say that I'm hooked for life this is THE only product that has ever kept my skin blemish free, flake free, super soft and glowing. The picture below is a shot of my new un-mixed Ocean Salt, when you first get it you'll want to mix it up so the salt is evenly distributed throughout. Most of the time if you buy it in the store they will do that for you.